WITH RUBBERIZED ACCU-GRIP available in the 3 MOST POPULAR GAUGES 0.60, 0.80, 1.00. 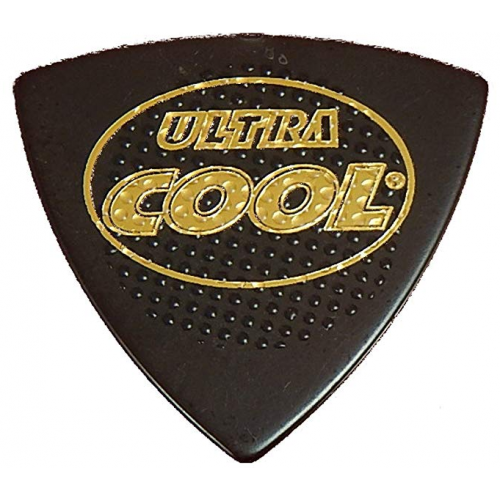 Cool Music brings you the perfect blend of form and function in our ALL NEW – ULTRA COOL SR SERIES GUITAR PICKS. Made from a patented new space age composite called CELLULON BI-MATRIX. This new material offers the buttery feel of a nylon pick with a super crisp attack exceeding that of celluloid. Crisp , Clean & True to your guitar’s own tone. Hear & feel it for yourself. If you drop it on a table you will hear the difference. Harmonically resonant micro-fiber technology is the key. It sounds like titanium, glass or similar resonant material! We at COOL MUSIC have used our patented AGT (APPLIED GRIP TECHNOLOGY) to help keep the pick in your hand comfortably. A coolcell rubberized heat sensitive accu-grip has been added to ensure a Positive grip on this REVOLUTIONARY, CUTTING EDGE PICK.